You may get lots of wishes on this Thanksgiving. 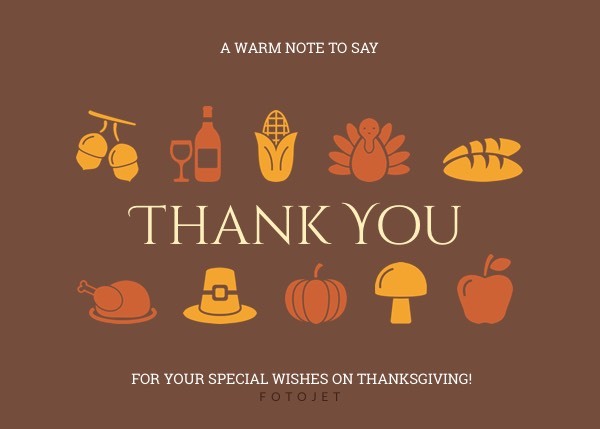 Now it is time for you to say thanks to your friends and family for their special and heartwarming Thanksgiving greetings. This Thanksgiving card template is specially designed for this reason. What you need to do is fill it with your messages and choose a way to send it away, printing it out or send it via email. If you have further requirements for making Thanksgiving thank you cards, don’t worry! All your needs can be satisfied since the template is fully customizable and many editing tools are provided.